Mauritania has foiled a plot to overthrow the country's president, its defence minister has said. Between 20 and 30 members of the army are reported to have been arrested for the alleged coup attempt. Defence Minister Baba Ould Sidi said the plotters were "the very same people who led the aborted putsch in June last year". He said they had planned to topple Maaouya Ould Sid'Ahmed Taya while he was away in France. In a recorded message on state radio he said the alleged conspirators planned to attack army barracks in the capital Nouakchott and other towns later this week. "The attempted coup d'etat has been foiled and the putschists have been arrested. The situation is under control," he said. A military source told Reuters news agency that the arrested men included 15 army officers hailing from the same ethnic group as the alleged ringleader of last year's coup attempt, Saleh Ould Hanenna. Mauritania has blamed Islamists for being behind that attempt. Some 120 soldiers are still being held in prison over that alleged plot. President Taya took power in a bloodless coup in December 1984. He has been re-elected three times since but has allowed little in the way of opposition. He has changed the country's loyalties, supporting Israel and the US. 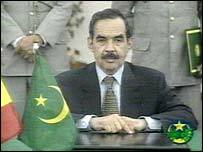 Mauritania became only the third Arab League state to establish full diplomatic relationships with Israel in 1999.